A little early but why not! Bettertax has been trading for 4 years on 1st July and has gone gone from strength to strength. The company started with 2 people (and a helper!). There is now 15 of us, all working together to bring you the Bettertax tax refund experience! Over the time, our branding has evolved to. Here’s our first logo and our first dudes. Working with the old adage, “never work with children or animals”, it was a sad day when the pig got the chop! We also dropped the .org as our brand was becoming more recognisable. 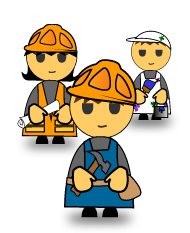 The Bettertax dudes got a small make over too… can you spot what it is? This is March 2011. During that year the logo and dudes got quite a new modern look, pulling the Bettertax corporate ID much more together. 2013 saw another change to the logo and dudes, which can be seen at the top of this page. Although fairly minor it also incorporated other elements to make our brand even more familiar and, we hope, friendly and approachable. We’ve seen how our clients love stickers, so that’s where the inspiration came from! Have you joined our social media communities where we post and update regularly? As we move through our 4th year we have many more exciting things planned to keep us as the number 1 tradesman’s tax refund specialist! Home » Blog » Happy 4th Anniversary, Bettertax!